Our Gypsy Wagon along with Gypsy Rose goes on display at local fairs, environment days & festivals. We also hire our Gypsy wagon for weddings and /or personal photo shoots. At her discretion, Karen is open to play her celtic harp at certain events with or without her wagon. Please phone us for further information regarding photoshoots, hiring and events. The “Gypsy Rose” Gypsy Wagon was handmade by the late Don Buckley to contribute to Gypsy Rose products promotions and marketing. 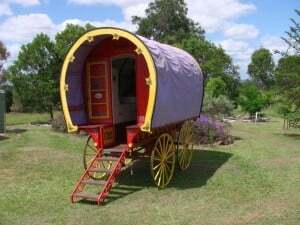 Karen lived in Dons original authentic square Gypsy Wagon in 1983 in the pristine forests foothills of Mt Mee basin. Don was a master at his craft and came out from England in his prime bringing with him the art of building original wooden carts, wagons and vargos. He also turned his hand to building slab log cabins and homes with lofts and unmilled timber interiors. Probably most of all, he built by hand some of the most uniquely handcrafted unmilled wooden furniture and features. He was also famously known for collecting Australian pioneer antiques from all over Australia. He also was the owner and builder of the ‘Squatters’ pioneer style resturant on Bribie Island. Karen and Don crossed paths and built an invaluable deep bonded friendship, inspiring each other for over 25 years. Over that period she lived in all his 3 ‘Tree House’ style houses, built in a gorgeous forest setting on a babbling creek. She was there to enjoy his last unique creation, a ‘meditation hut’ balanced over the top of the creek.